We are living in an era unlike any before in which migration is taking place on a global scale. As such, you may have noticed that people from outside your country are now working, living or studying side-by-side with you. One such people group are Muslims. The Muslim diaspora in the West presents a unique opportunity for mission work. The uniqueness of the Muslims’ presence, neither as conquerors nor as conquered, but as neighbors, co-workers in the work place, fellow students, and immigrants, is a new situation which has no parallel in history. The need for communicating the gospel of Jesus Christ to Muslims, in ways that are accurate and contextually coherent, is both obvious and urgent considering that it has been estimated that over 80 percent of all Muslims have never heard the Gospel, which means that four fifths of the Muslim world is still waiting, many of whom are right here at our door step. This migration is an amazing act of God as He brings these precious people into our sphere of influence so we can enter into fulfilling Jesus Great Commission of making disciples of all nations. Over the past couple years I have had the privilge of conducting seminars at a number of churches in North America with the focus on the training of fellow Christians to reach their Muslim friends and neighbors with the Gospel. 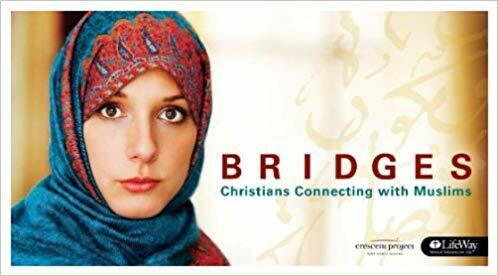 One of the resources that I have used is Bridges-Christians Connecting with Muslims from Crescent Project. In my opinion, this is the ‘go-to’ course for equipping Christians with the knowledge and confidence to engage their Muslim friends and neighbors in spiritual conversations in a way that leads them to the saving knowledge of Jesus Christ. Christians have reacted to Muslims in many ways but all too often without the compassion that characterized Jesus. Bridges helps Christians connect with Muslims. This dynamic study-featuring real-life stories, interviews, and practical teaching-clears up the confusion surrounding Islam and helps you see Muslims as Jesus sees them. The Bridges course includes six sessions made up of prayer, discussion, video content, group response and action assignments. All of these components are meant to develop a better understanding of Islam and to give the student a heart of an ambassador as they relate to Muslims. Each of the sessions are around 25min. duration (DVD format) and is accompanied by a workbook that is used while viewing the sessions. In this Bridges Study Trailer, Fouad Masri explains the purpose and need for Bridges and how it will enhance the effectiveness of the Christian’s witness to their Muslim friends and neighbors. The following testimony illustrates how one Muslim woman came to Christ when a fellow student took the step to reach out to her with the saving knowledge of the Lord Jesus Christ. Don’t wait for tomorrow, equip yourself today through resources like Bridges and let the Holy Spirit empower you so you too can bring your Muslim friend one step closer to Jesus.